FDA-approved hand-painted ceramic, Snoopy’s Cookie Jar is charming and collectable. Available exclusively from Teleflora as a part of the Flowers-in-a-Gift collection. This Christmas, Teleflora is excited to #SendCheer with help from the PEANUTS® Gang! 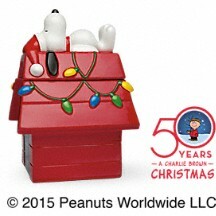 Watch Snoopy deck out his iconic doghouse in our new commercial for our PEANUTS® Christmas Collection.